Saturday October 31st 1908 I worked in the kitchen most of the forenoon with the baking and churning. Will went to town after an early dinner. I cleaned out the closet in our room and gave the kitchen a good going over by washing wood-work and windows. I had supper early and went with Frankie [Pointoin?] to the concert at the M.E.Church. It was very nice. It looked like rain but we got home safely. Sunday November 1st 1908 It rained about church time so I did not go. I was busy about the house all morning. The weather kept me from going to Woolfs in the afternoon. I cleaned out the desk. Did the evening work and read some. Monday November 2 1908 I did the washing with Wills help in the morning and got the dinner over so I went to town at 1.12. came back at 2.39 and did the ironing before five oclock. I wrote to Lydia in the evening. 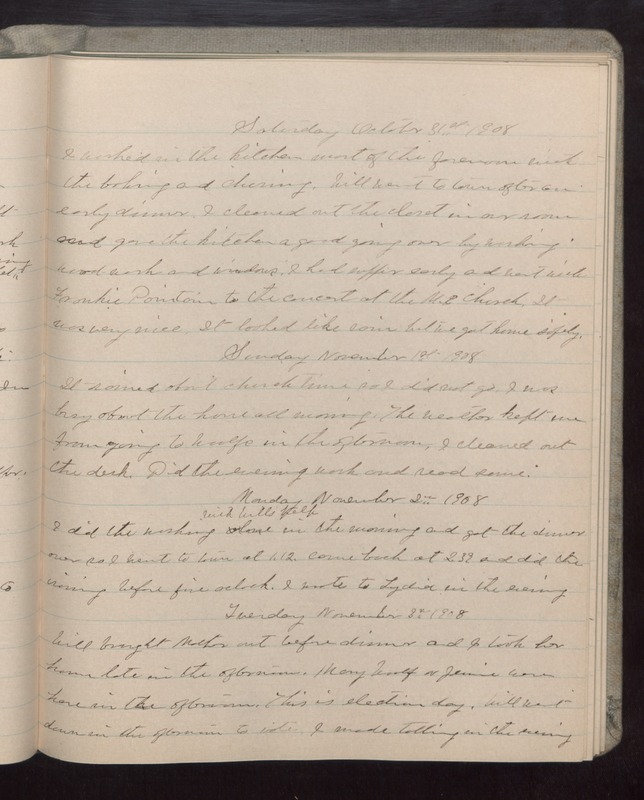 Tuesday November 3 1908 Will brought Mother out before dinner and I took her home late in the afternoon. Mary Woolf & Jennie were here in the afternoon. This is election day. Will went down in the afternoon to vote. I made tatting in the evening.